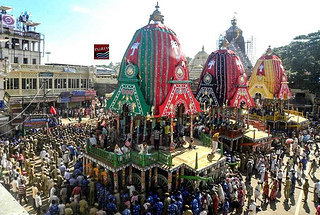 The most celebrated and respected festival of Odisha, Ratha Yatra or the Car Festival, the Fe stival of Chariots, is held with religious grandeur at Puri, the south-east seashore town Nabakalebara Rathyatra 2015in Orissa. The presiding deities of the main temple, Sri Mandira, Lord Jagannatha, Lord Balabhadra and Goddess Subhadra, with the celestial wheel Sudarshana are taken out from the temple precincts in an elaborate ritual procession and seated on three colorfully decorated huge chariots, which are then drawn by hundreds and thousands of devotees on the Bada Danda(Grand Road) to the Gundicha Temple, some three kilometers away to the North. After a stay for nine days, the deities return to their abode in the same way.